This book uses a unique approach to teach life lessons to children by engaging a monster creature named Bleagh (pronounced Bleh). 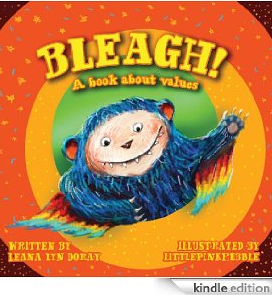 Doray prefaces the book by giving the three definitions of bleagh: 1) the name of a friendly monster who wants to make new friends, 2) the sound children make when they smell something unpleasant, and 3) the sound that a friendly monster makes. At the beginning of the story, the reader meets Bleagh, a friendly but ugly homesick monster who has just arrived at school for the first time. Bleagh misses his other monster friends and does not understand the language or the customs of these children who appear terrified of him. Their teacher, Ms. Lyn explains that the creature is not mean but afraid so they should show EMPATHY for him. They do make an effort to do just that, but Bleagh terrifies them with the sounds he makes. She encourages the children to show TOLERANCE, but that is very difficult to do when the creature opens stinky garbage to eat for his lunch. Some of the children get the brilliant idea to give him a pile of stinky socks to eat. The classroom practices COOPERATION when they all must assume different roles in a class project. There are team leaders, presenters, timekeepers and illustrators. When the time comes for the students to examine all their work hung on the walls, Bleagh says that one of them, “looks like a baboon’s backside.” He has the children in tears. Ms. Lyn says, “You never truly see something till you see beauty.” After a few moments, Bleagh steps back and notices new colors and patterns, exclaiming, “It’s fantastic.” They all break out in applause. Near the end of the day, Ms. Lyn reminds them that it is time to vote for the Star Student of the day. Bleagh wants to vote for himself, but decides that would be cheating. So he displays INTEGRITY and votes for Ming instead. There is a surprise ending that all readers will enjoy. In addition to the four highlighted virtues embedded in the story, there are spellbinding illustrations of monsters, exotic plants, art work, and the classroom in which the children work. Little Pink Pebble has done an amazing job of portraying the story line and moods of the characters. The drawings display multicultural children in beautiful colors and exotic settings. Furthermore, the lessons it promotes have universal appeal and relevance. I highly recommend this book to parents and teachers of children age seven and up. If you have enjoyed reading this post, please subscribe by clicking on the word Follow or hitting the orange RSS feed button in the upper right hand corner. Great review! This book looks like a cute colorful story with positive messages. Actually, at first I was a bit turned off, but as I began to read I was really impressed by the presentation and the message. It looks like a cute book. Thanks for linking up with Poppins Book Nook. This book sounds adorable. I have to look for it for my daughter.